Tents serve as a great option for organizing parties, outdoor camping, promotional events, and weddings. There are different types of tents, designed to serve a specific purpose for example, wedding tents for outdoor weddings, pole tents for a large gathering etc. 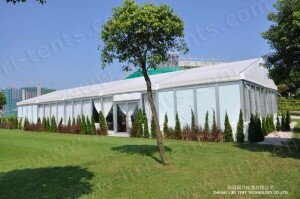 Whenever you think about holding an outdoor activity, event tent is the next thing you consider. These are great as they shield your guests from the sun or wet weather during the event. Irrespective of your event, be it a wedding party, birthday party or any other celebration one may have, choosing the right tent for your occasion will ensure that you have an unforgettable experience. Frame tents don’t have a center pole but are supported by special hardware. They are small in size and can be used in outdoor and indoor venues as well. These can be used where erecting big tents could be a challenge. The down side of these tents is that they are small and are difficult to re-locate. Erecting them is also a big challenge. This is the most popular of all the tents. They are used for different events, be it formal or casual. They are highly portable and are very cheap to rent. They are very easy to set up and are large in size. This means that they need an ample large ground area to set up. This is the kind used during disaster relief areas. 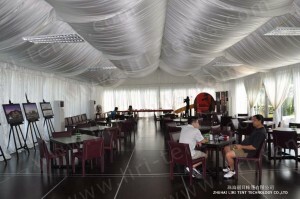 High peak tents are used at events that last for a long time. They are mostly considered for wedding receptions due to their elegance. This tent is durable and is very resistant to strong winds. The roofs are peaked such that rains run through without any difficulty. It’s highly portable and is more expensive than other types of tents. Decorations that are involved in the tent may also affect the size of the tent. For most events, there is need for a dining area & dance floor, which calls for an extra tent covering. If you are hiring catering services, they will need a separate tent where they will cater for their needs without outside commotion. You need to also consider the personnel that will be serving refreshment as they will need their own tent as well. Details that one should keep in mind when buying event tents. Tent pole drape covers – These are an inexpensive way to dress your party. Mostly used for weddings or in upscale events. Air-condition – These are necessary if your tents are side walled in order to help circulate the air in the tent. Keep these details in mind will make your party successful.